Proposition Chicken....what am I missing? Aug 25 Proposition Chicken....what am I missing? 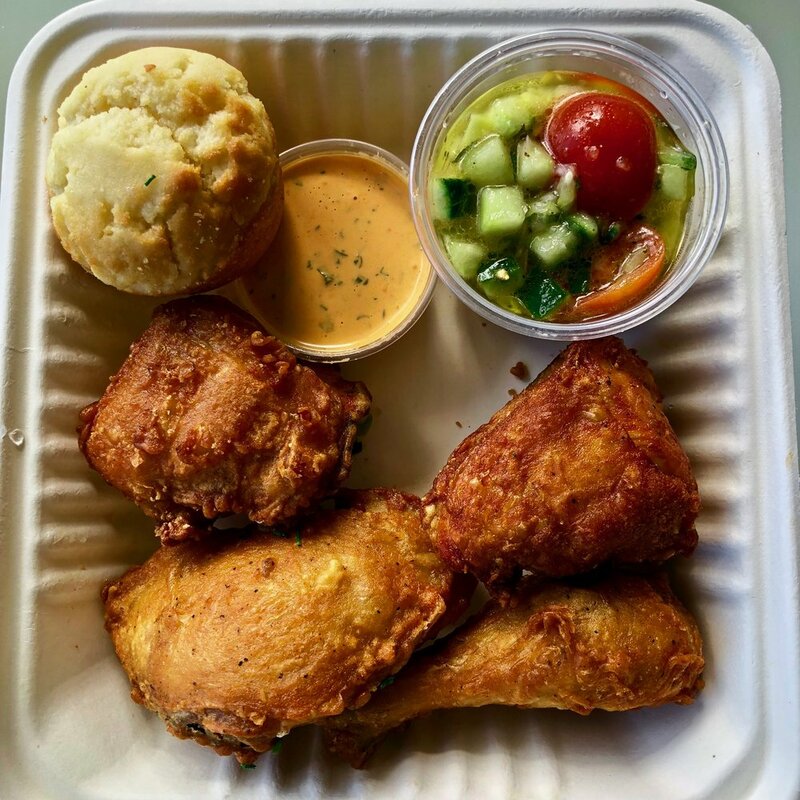 Part of my recent fried chicken sandwich adventure was a return visit to Proposition Chicken, a place was not all that enamored of in the first place. And while their fried chicken sandwich didn't totally wow me (or the SO), I didn't completely hate it. Though, it wasn't necessarily the chicken part as the reason I gave it a pass. Still, since it had been like seven years or something since I had eaten there, I figured they had managed to stay open this long they must have something going for them that people like. I mean, the restaurant business in SF is brutal and to be able to survive, particularly in an odd location at Valencia and Market, they must be doing something good, right? It was with this in mind as I decided to get a few additional items to check when ordering up the fried chicken sandwich. The joys of GrubHub is they seem to be adding new restaurants for delivery daily and I was able to get some dishes in the comfort of my own home to try and see what I might be missing about their chicken. I figured with all the fried stuff why not try to be a little healthy and get some vegetables in the form of a salad--the fried chicken salad. A mix of kale and romaine lettuce with cucumber, mint, cherry tomatoes, shredded parmesan, chunks of fried chicken and a black pepper parmesan dressing which comes on the side. If nothing else, it definitely makes for a colorful photo. Size wise it is pretty big for a salad and the greens are quite formidable, fresh and crunchy. The mint was a little lost on me, which is fine as I'm not the biggest fan of that in savory dishes. Reminds me too much of gum or toothpaste. The chicken was white meat pieces and you get, or I got, seven pieces. Okay, though not exactly overwhelming. Though much like the chicken on the sandwich, the pieces were on the slightly dry side and part of the saving grace is because you can add some dressing to fill this out and flavor it up a bit. The black pepper parmesan was kind of thick and somewhere between a Ceasar and ranch type dressing. Definitely has a tang to it and it may not be to everyones liking, thus get it on the side. It does kind of all come together with the dressing, though I was still not overly impressed with the chicken. Plus for a dollar less, I could get a sandwich with the same amount of chicken and lettuce and a side. You'd think it would be the other way around. Consider myself underwhelmed. Hmm, so for a dollar more than the salad you can get a meal with three pieces of chicken, a buttermilk biscuit and a tomato and cucumber side salad. I had the meal the first time here and and the difference it you don't get a choice of sides and instead of some kind of ranch sauce for dipping it is kind of a spicy aioli thing. I guess I immediately get suspicious when you get a dipping sauce with fried chicken that isn't chicken fingers. First and foremost, the chicken was just okay and not especially dry or overcooked. I think one of biggest qualms is the chicken you get doesn't look like they chicken on their website. There is seems to be lightly breaded with a nice crispy brown crust with bits of black pepper. Here, it just looks like they sprinkled some black pepper on the chicken skin and deep fried it as is. In basic terms, it means there is not a whole lot of flavor going on. Most of the skin was a bit crispy though it was not as juicy as I might have liked. Considering how many places in this town do a decent to above average fried chicken, theirs seems to pale in comparison. The side "salad" thing was a really just a throw away side. Easy to prepare and cheap to produce. Not to mention, way too much oil causing the veggies to go a little soft. As for the biscuit, well, it wasn't the hard hockey puck scone type thing I originally got, so there was that. I'm hard pressed to call this a real biscuit though, seemed more like a buttermilk muffin or something. Not bad per se, but not really a biscuit either. The dipping sauce tasted bitter and I wasn't a fan. In fact, I just wasn't a fan for much of anything going on here. I guess I am just not sure what keeps this place in business enough they have even opened a second location in Oakland. With so many other places in town doing a much better version of fried chicken, I must be missing something. The chicken isn't crusted and more often than not comes across as dry or over cooked. The sides can be lacking and the biscuit isn't even close to being fairly called one. At this point I will just have to chalk the place up as being in my taste bud blind spot. No matter how much I try them, I am just not impressed as much as those who may like the place. That is the thing with food, people like different things and we all are not going to always agree on what tastes good and what doesn't. Proposition Chicken is a spot I can't personally recommend and don't see the appeal of. Thus the joys of dining in this town, I can leave this place to those who like it and get my own fried chicken fix elsewhere. Sep 2 House of Tadu Ethiopian Kitchen....that's a lot of colorful stuff?